So now seems like as good a time as any to contemplate Donald Trump's impact on the world of wine. And what an impact it's been! As he himself gets someone else to put it in The Art Of The Deal, 'I like thinking big. I always have.' And, 'From the very start, size was a top priority.' And, 'It's larger than life.' And, 'Listen to your gut.' If I ever wanted a teetotal megalomaniac casino developer to blend my grapes, than Donald J. Trump would be the man: it's all about quantity and bowels. Yes, we have a potential situation with Trump's teetotalism (his older brother, Freddy, died an alcoholic which kind of accounts for it) but a mere complete lack of familiarity with something is oviously no bar to success in that chosen sphere. So Trump wines? Or vodka, even? Why ever not? 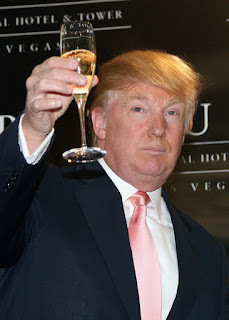 Well, not the vodka, obviously, as that's gone the way of Trump University, Trump Magazine, Trump Institute, Trump Airlines, Trump Steak, Trump: The Game, Trump natrual spring water, Tour de Trump, Trump on the Ocean, and Trump Network. Trump Vodka ('Awful,' according to one critic) was axed from most markets in 2011, despite being offered in a gold Cubist bottle with a vast T on the front. Nevertheless, the wine persists, with a smart website telling you all about the sprawling estate in Virginia where they make the Trump range, plus a list of its numerous awards, plus a calendar of upscale events like the Mother's Day Brunch and the Bastille Day Vine and Dine. And there's an online shop, which sets my heart pounding at the thought that I might be able to acquire some of this stuff and thereby get that tiny bit closer to the current leader of the free world. With tragic inevitability, however, you can only get it shipped within the States, and not all of them. Why not Kansas, Delaware, West Virginia or Arizona? What have they done to be deprived of the Trump Winery's unique Fortified Chardonnay, known as Cru? Made by 'Blending Chardonnay juice with grape brandy', this 'Fortified wine is then aged for over a year in American bourbon barrels', but if you're stuck in Wilmington or Bisbee, you have nothing to look forward to. It's even worse here in the UK, where I am reduced to speculating on whether or not I could persuade my New York friends to blag a couple of bottles and bring them over the next time they're here. I don't know: could I be bothered to drag a couple of Nyetimbers over to them? No, of course not. Which leaves me, for now, supplicating the internet for other people's reviews of Trump's output and trying to get a sense of it that way. Naturally, one wants these reviews to be as highly-charged and inflammatory as possible, given the kind of person Trump is. But things are more nuanced than that. Even critics who have clearly set out to rubbish Trump Wines sometimes find themselves wrong-footed into grudgingly faint praise: 'This could actually be much more offensive,' says one, about Trump's Cabernet Sauvignon/Merlot/Cabernet Franc Meritage 2014; 'Actually...quite subtle', says another reviewer about a white Trump; 'Well-crafted and food-friendly' is a third cautious encomium. The consensus? Trump Wines are quite often quite okay. But then again: what really sticks in the mind is the way that the Trump Winery website harps on about so much that isn't actually wine. Yes, lots of wineries try to get you to consume things that are only incidental to the booze itself - guided tours, online sales, corporate functions in the fully air-conditioned Sauvignon Suite - but the Trump Winery not only has tastings, online buying, corporate events and commemorative meals, it also offers four different kinds of wedding experience, a wine club, toy dogs, baseball hats, semi-automated donations to St. Jude's Hospital and a frilly, conspicuously set-dressed boutique hotel with a swimming pool, 'A culinary experience unique to Virginia' and rooms at $449 a night. Given that Trump picked the estate up for not a huge amount before handing it over to his son, Eric, it's hard to imagine that it has much resonance for him. Could it be that Trump, wine and Trump Junior are only in it for the short term? And that some larger ambition awaits the estate? 'I never get too attached to one deal or one approach,' the great man has said. Which I think is something we can all learn from, especially if we've spent the morning drinking a bottle of fortified Chardonnay while wearing a themed baseball hat. "Blending Chardonnay juice with grape brandy"? So like Pineau Des Charentes, then? Except they age it for a lot longer than a year.